Today’s open house search took me to 1 Ticonderoga, a J.M. Peters home in the Woodside II neighborhood. 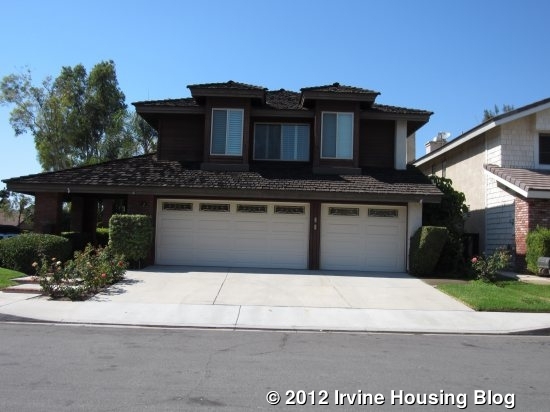 This house is the biggest floor plan in the neighborhood, featuring four bedrooms (one downstairs), three full baths, a large bonus room and a three car garage. It is on a corner lot, so the yard is slightly bigger than average, and the street it borders isn’t too busy. There are no HOA dues or Mello Roos taxes. *The days on the market number is slightly misleading. 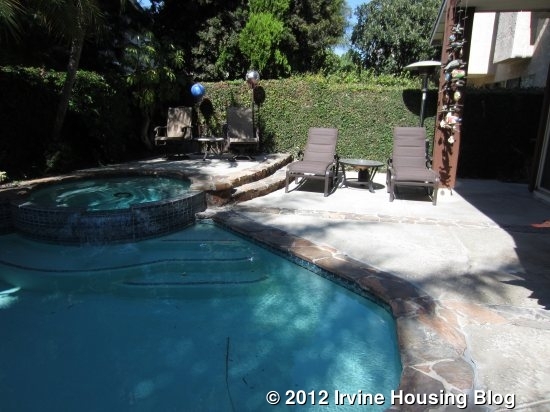 It was previously listed and had a buyer, but subsequently fell out of escrow. It was taken off for awhile and upgraded, then put back on approximately six weeks ago. There is a covered walkway leading up to the house. 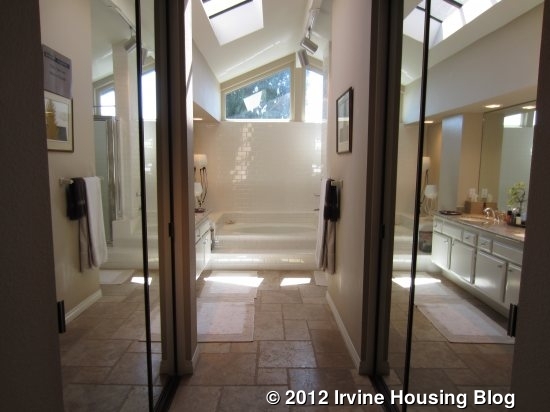 The entryway has vaulted ceilings and the staircase is right in front of you. The downstairs is a combination of travertine floors and carpet, both put in about a year ago, and the same carpet was installed throughout the entire second floor. To the left, there is a sunken living room with several windows. 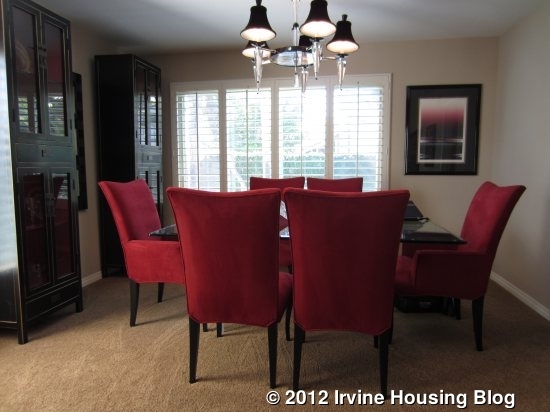 The dining room is behind the living room, but two steps higher. Both rooms are a good size. 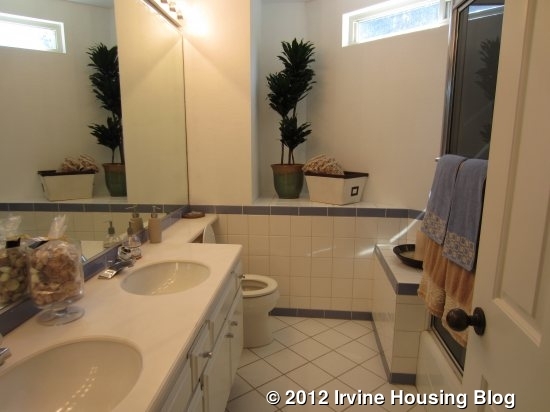 To the right of the entry, there is a closet, a full bathroom with new granite counters (but old cabinets), and a small laundry room (no sink or counters) that leads to the garage. The downstairs bedroom has a small closet and a set of built in shelves. 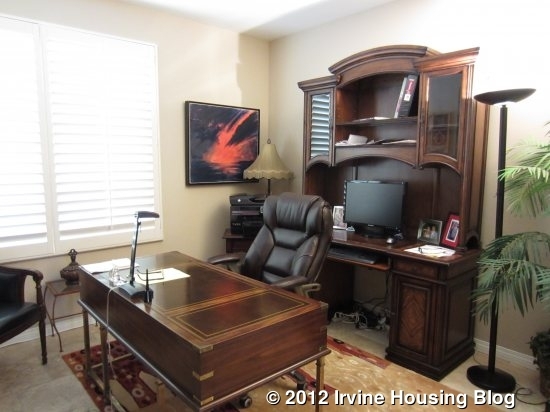 It would work well as a bedroom but, with the darker wood used for the built-ins, I like it better as an office. 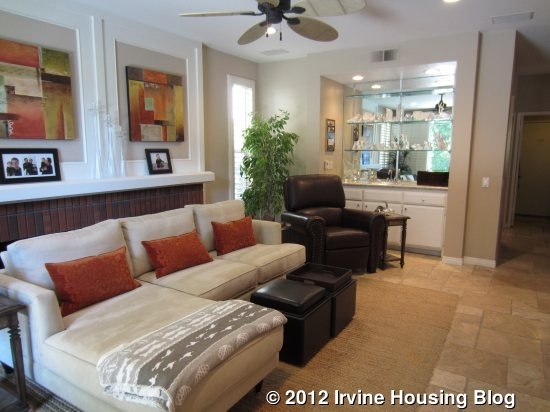 Past the bedroom is the family room, featuring two side-by-side fireplaces and a wetbar. I don’t really see the point of the dual fireplaces and, apparently neither does the current owner, because the couches are set up in front of them. 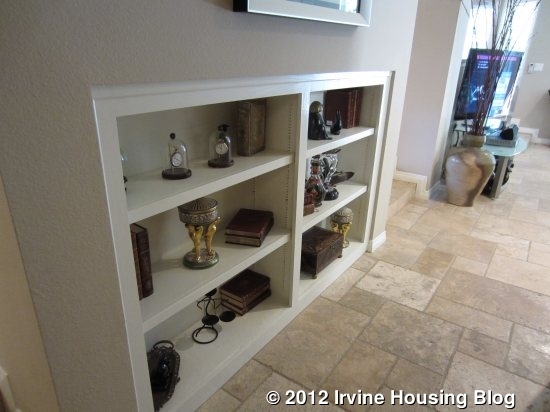 The family room has travertine floors, which always feel cold and impersonal to me, but is a popular look these days. The family room can be accessed from the hallway in two different places – one near the downstairs bedroom and another around the back of the stairs – as well as through the kitchen. 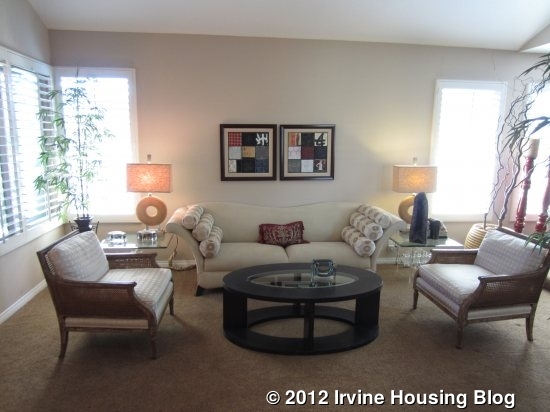 Like the living room, the family room is two steps lower than the other rooms. The kitchen overlooks the family room. 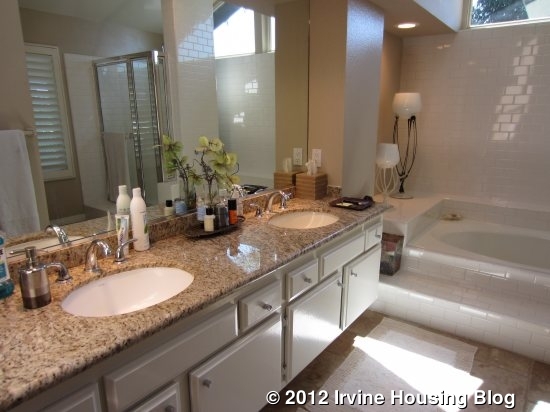 It has a breakfast nook surrounded by windows and new granite counters. The appliances are a mixture of black and stainless steel and a variety of brands. 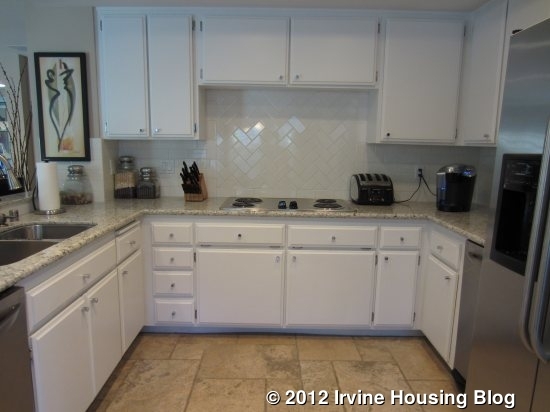 The cabinets are painted white and haven’t been updated, creating a strange contrast with the new counters and new backsplash, so a buyer might want to upgrade the cabinets as well. The backyard has a saltwater pool and spa, with patios on each side providing space for lounge chairs, a bbq and a casual dining table. 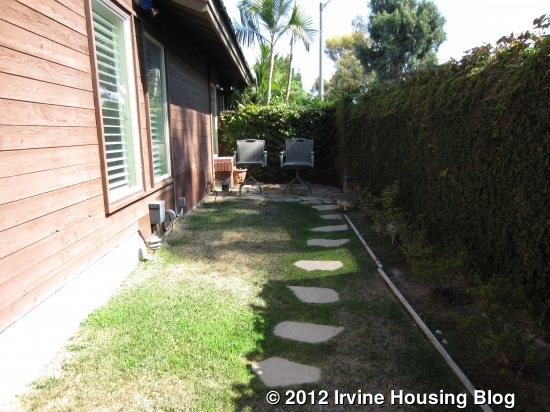 The side yard is grassy and slightly wider than in most houses, so it could be used as a small play area for young kids. 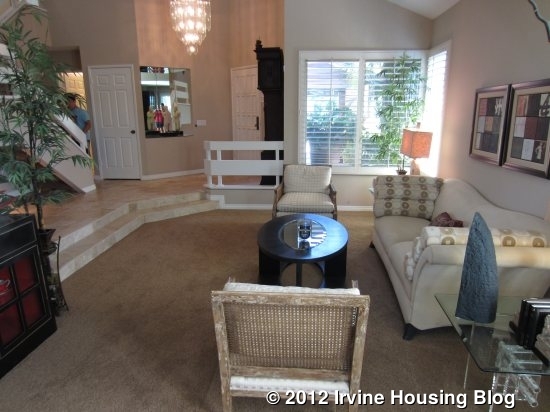 Upstairs, there are three bedrooms and a huge bonus room. The two secondary bedrooms have mirrored closets and are an average size. They share a bathroom that is covered in tiles and looks very outdated. 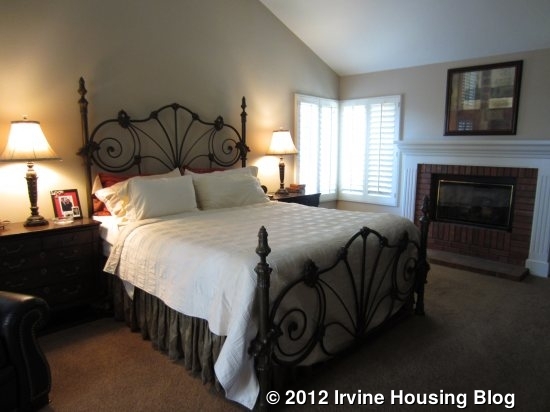 The master bedroom has vaulted ceilings, a fireplace and many windows. 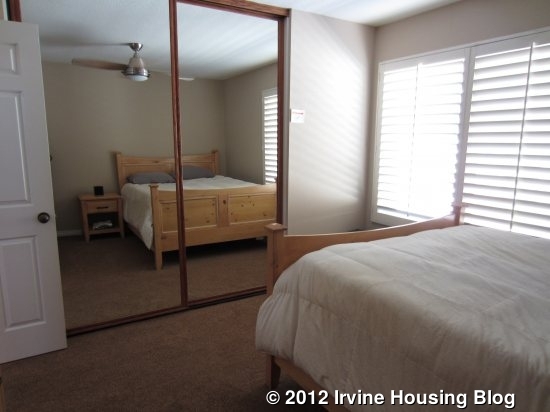 There are two closets with mirrored doors, but they are actually walk-ins (one larger than the other). The bathroom has been partially remodeled, with new granite counters and new tile in the shower and bathtub, but the cabinets are still old. I thought the shower was a little too small and didn’t like the wide tile ledge in front of it. The bonus room stretches the length of the three car garage. 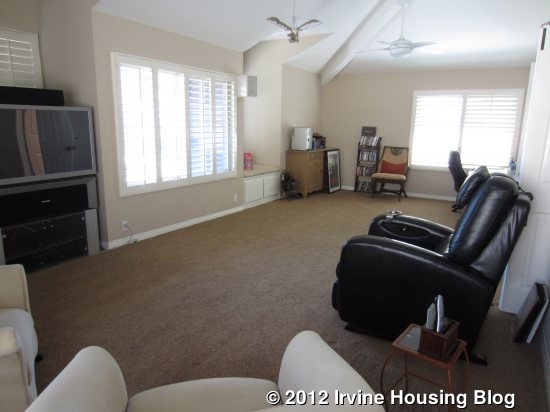 It has vaulted ceilings and two ceiling fans (most rooms in the house have at least one fan). The room can easily be divided into different areas and used for multiple purposes. Overall, I like the general layout of the house, but I dislike how the downstairs has all the different levels. I also don’t like the travertine floors, but I did like the carpet in the rest of the house. There is a big open area under the stairs that could be closed in to create storage and to give the house a more modern feel. All of the windows have attractive plantation shutters and the ceiling fans throughout are a nice touch. 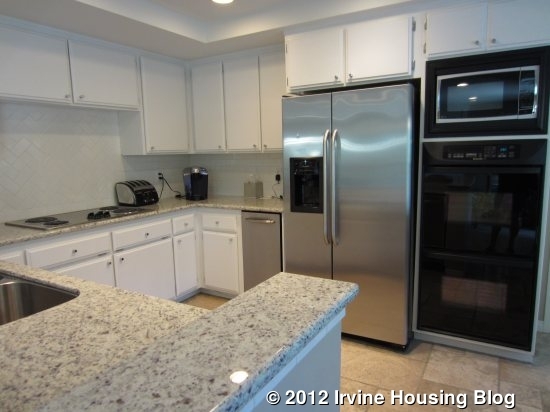 I wish that the cabinets had been upgraded along with the counters to give the rooms a more uniform feel, instead of the contrast of old and new. At $929,000, the price sounds high but it is in line with recent sales for comparable homes. 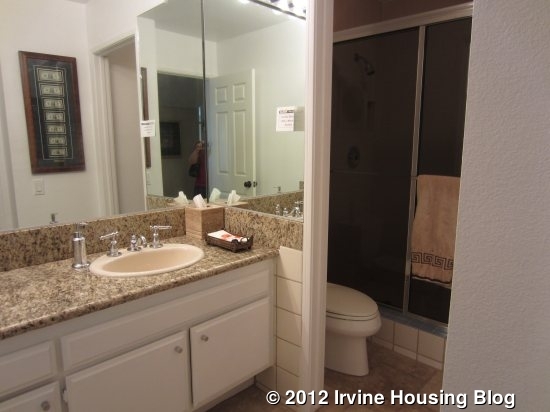 This entry was posted in Real Estate Analysis on September 20, 2012 by Karen.